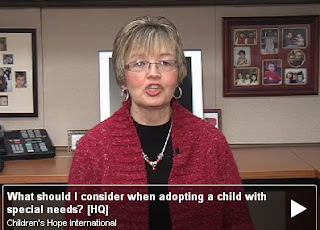 Children's Hope International: What should you consider when adopting a child with special needs? Tell us your thoughts. What should you consider when adopting a child with special needs? Tell us your thoughts. Adopting a child who is older or has medical needs? These children, known as special needs children, are amazing kiddos deserving of loving forever homes. But what does it take to parent a child with special needs? What should you consider if this is the road forward for your family? China Program Director Tina Qualls helps start this conversation with you this week, via CHI-TV. And, if you have adopted a special needs child, you can help finish it. Let us know what was on your heart during your adoption process. Post your comments! If you are considering adopting through the Waiting Child (Special Needs) Program, tell us your thoughts and ask your questions. I AM AFRIAD OF GETTING ON A PLANE CAN I ADOPT A CHILD FROM CHINA AND HAVE THE CHILD TRANSPORTED ? Thank you for your comment, Celeste. China does not allow a child to be transported. At least one parent must travel. Depending on how deep your fear, you may be able to overcome it. There are many resources and articles available online, and seeing a counselor is a good place to start - if this is something that really is on your heart. If you would like to speak to one of our outreach consultants about adoption, please call (888) 899-2349.